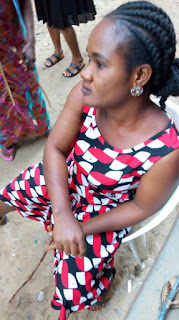 There was pandemonium yesterday in Bethel Nursery/Primary school in Sapele area of Delta state after a woman who just gave birth two weeks ago - stormed the school yesterday morning to flog the bursar after her children were not allowed to write exams because they didn't pay their school fees. It was gathered that the woman's husband had made trouble and threatened the headmistress few days ago over the same issue. The woman allegedly even bit one of the teachers who was trying to restrain her from flogging the bursar. Pictured below is the bursar with her her flogged hand after the woman's attack.